The members of the Royal family which includes Da’i and his close associates, assembly members and dignitaries with special permission wear a white turban (paghdi) made of cotton cloth on a thread topi carries a distinction, unique identity and a mark of respect. The turban of a Da’i and his deputy (ma’zoon) has a small piece of golden cloth which is evident on its front side and this distinguishes him from others. It is worn in prayers, functions, feast, funeral, assemblies etc. 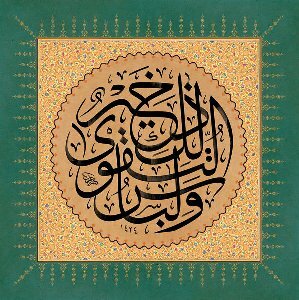 It is made only by the permission of Da’i and by the ladies (mastooraat) of Royal family at the Da’i’s residence. Nobody can wear this turban unless permitted by Da’i. Alavi Bohra’s traditional dress for man is white kurta, pyjama and a special cap weaved from white-silver-golden thread called topi. He is supposed to wear this attire in religious rituals as well as social gatherings where there is a presence of Da’i or his representative, whether he be in mosque, mausoleum, graveyard or when he comes to meet someone at the Da’i’s residence. He puts on a golden turban pheto instead of a traditional topi and an outer robe called ‘abaa or sayaa especially during the marriage ceremony. For woman, the dress code is a veil which covers her entire body from head to toe called as rida. There is no rule of its colour or pattern, but not a single body part of chastity and modesty should get revealed to a person with whom she can marry (ghayr-mehram). Traditional rida is made of two pieces; upper (pardi) and lower (ghaghro) stitched with beautiful laces and adorned with imitation materials. Like man, woman is dressed in rida on all religio-social occasions or when she goes out for some work. This dress code has now become an integral part of her social life and is coined as a unique identity of a Bohri woman. In Madrasah Taiyebiyah, the dress code for boys is white loose long shirt (kurta), loose trouser (pyjama) and topi and for girls is white loose long frock (kurti), loose trouser (izaar) and scarf. Alavi Bohras eat collectively in a group of 7 persons at social functions or with family members at home in a traditional big round plate known as a thaal while sitting on the floor. Eating with spoon and fork is not permissible i.e. one has to eat with his right hand fingers and not by using left hand. Also one cannot sit and eat on table or chair with exception that one has any health problem. This is a tradition (sunnat) of the Prophet Mohammad (saws) who sat with his household i.e. Ali, Faatimah, Hasan and Husain (panjatan paak) in a big round plate and used to eat the holy dishes of the Paradise send from the Heavens. That heavenly plate came to be known as maa’edah. Every year during the New Year’s Eve, every Bohra’s house witnesses a specially decorated thaal with a variety of dishes made from cereals (popularly called as lachko), vegetables, fish and meat. It is considered a good omen for a house to sit together in this thaal and begin the feast with the name of Allaah by taking salt, sugar, milk, honey etc. When Da’i presides on any social function, his permission is first sought and a thaal is presented before him, then only other thaals are distributed between guests. After he takes first morsel, others start eating after taking his permission. Manners and etiquettes are maintained strictly while eating and sharing the dishes. Salt is tasted first by reciting Bismillaah after which the eldest member in the thaal eats the serving first. The thaal must be clean and free from any remaining food after eating. Each member takes the amount of serving which is sufficient for him. Wastage and excess of food is not permitted. Every member again tastes the salt at the end. One has to sit with his legs folded backward and see that nothing falls down while taking morsels on the plastic sheet (sifrah) kept below the thaal.